Kylie Jenner announced the birth of her first child, a girl, on Sunday, February 4th, 2018, and marked the occasion with a thoughtful post on why she kept her pregnancy a secret and an 11-minute home video documenting her entire pregnancy. The video was more intimate and revealing than we expected, and yet one aspect of Jenner’s pregnancy journey is still under wraps — her daughter’s name. Twitter has some guesses, of course, and thinks that Jenner is going to name her daughter Butterfly. Yes, like the insect. Jenner and her boyfriend Travis Scott have a ~thing~ for butterflies. The couple has been dropping the blue butterfly emoji in social media posts for the last year, Jenner owns butterfly rings, they have matching butterfly tattoos, and there’s a close-up shot of a blue butterfly necklace in the pregnancy announcement video. The butterfly could just be a symbol of Jenner and Scott’s love and not actually the name of their child, but Twitter legit thinks their newborn baby daughter is named Butterfly or some other butterfly-related word. Mariposa is Spanish for butterfly and while we’re not aware of Jenner or Scott having any Spanish ancestry, the Mariposa theory makes the most sense if we’re stuck with the butterfly theme. Kylie's daughter's name is probably Mariposa since it means Butterfly. Her nickname is probably going to be Posie (like one of her lipkits) which just so happen to be released tomorrow as an anniversary trio lip set👀 Mary is also her grandmother's name. Or maybe it’s Blue? 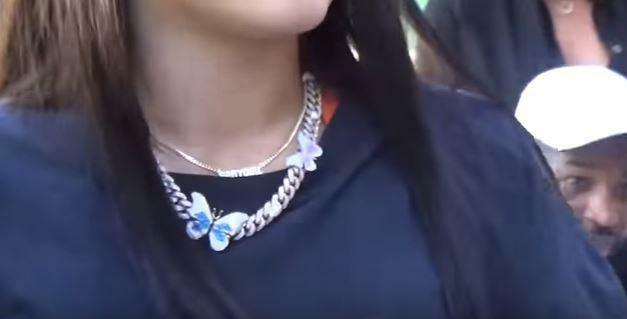 Since Jenner and Scott’s preferred butterfly is a blue one. Or maybe they named her after a specific butterfly like Monarch or Tiger Swallowtail? Ermm, maybe not. Since Jenner’s entire pregnancy was a secret, maybe we’ll get a name when the kid goes to school. Or maybe watch as Jenner names her daughter something incredibly normal like Karen or Kate.